Voters countywide believe in transit. “Make it easier to get around without a car” beat the car-centered by alternative by 11 points outside Seattle and by very wide margins when including the city. People are desperate for a transit plan that will increase their freedom, but Metro hasn’t offered them one since 2014. People believe right-of-way is critical. Even a homeowner-skewed non-Seattle residents favor the Center City Connector and bus lanes, because they recognize that traffic separation is the key to freedom from it. Seattle voters have approved rapid buses again and again, only to have their elected leaders water them down each time in a block-by-block war of attrition. Tolls, bike lanes, and relaxed parking requirements are not as popular. Conclude what you want about anti-bike homeowners polluting the sample, but the same people willing to embrace bus lanes and giving up on a fast drive are not nearly as excited about giving up their precious on-street parking to bicyclists and new residents. The bike lanes are more popular, however, than the other two. The Sound Transit questions weren’t framed in quite the same way, so comparison is more difficult. The countywide view is somewhat negative, but given the sampling issues, and the role of two other counties, it’s hard to see any prescription for the Sound Transit board. However, light rail is clearly popular in Seattle, and voters would be open to some sort of in-city measure. A popular policy is not identical to the right thing to do. Leaders with a firm belief that it’s wrong for bicyclists to be murdered in the street deserve praise for following their conviction. But these results show that there is a thirst for high-quality transit, quickly and competently delivered, that our institutions can’t seem to provide. What a pic that is of “Buses and pedestrians on Third Avenue in downtown Seattle on Jan. 10” . I think we should add more colors to all our new bus lines so that the collage makes Seattle look more pretty and artistic. At least it is not yet as bad as Bogota, the BRT capital of the world, but like Bogota, there is still hope for Seattle considering how Bogota is in the process of replacing most of its BRTs with a metro. When the poll is actually looked at, it paints a much grimmer picture. Even in Seattle, over 25% of respondents said that the current level of transit planning is poor. This is second only to immigration as the biggest contributor to transportation issues. Our transit is simply unacceptably subpar, and those in charge don’t care. The population knows it, and the poll supports it. Also, as someone who does extensive volunteer work for the homeless and underemployed, I can assure you those numbers would be much higher if renters, shelterbound, or tent city residents were polled. Higher enough to take the top spot. Once you step out of the Ivory Tower, you can’t ignore the sheer volume of the complaints regarding Metro and Sound Transit. les, two minutes’ google search on “Buses in Bogota” show me only a first-rate express bus system, and also buses in different services with widely-varied company colors, but seemingly good condition. Serving a population of about ten million people, in a service area that terrrain-wise looks a lot more like LA than Seattle. They’re doing a Metro? Good. Are you saying those colors indicate they’re doing something wrong , or am I reading you wrong? Am getting same vibe as from some other people’s comments about the foot-tram pushers in the Philippines- polite discomfort over the exact level of energy Seattle needs more than anything else to make a Minor Asteroid-Class city out of it, let alone World. But A Joy, from painful personal experience I truly sympathize with your fury about our transit deficiencies being glossed over. My thirteen years’ Metro driving more or less spanned the design, building, and opening of the system that became Sound Transit, including Link. We five drivers who really believed in the project weren’t a majority in our own ranks, nor was our level of political intensity widely shared. But in the days when my low seniority gave me many split shifts, I often delivered Public Comment to Metro Council meetings literally fresh from behind the wheel. Last I looked…position is still open. My fulminations about Metro’s complete waste of a fortune in signaling equipment that could’ve doubled through-put and rendered everybody’s ride a fast-moving pleasure…I WAS THERE!!!! Often regret that of the thousands of crush loaded machines that went in one portal, at least one, and all its passengers did not eventually come out the other. Which I’m afraid plain sanity unjustly conspired to make Company standard. So was only funeral music to my ears every time a luggage-loaded traveler would say to me: “Wow! Buses and trains together! Wish those lazy idiots would do that back home in New York! And……It’s CLEAN!” Like, shut up, man, that Metro Council member across the aisle can hear you! Only thing worse was on usual winter vacation to someplace transit-pertinent like Boston or Pittsburgh, standing through a bitter local passenger’s tirade about the plain crooked lousiness of I system I’d give anything for us to imitate. A J, for what it’s worth it, you’re absolutely right about the defects, and the excuses, and the rhetoric. But there is something you can do to correct the situation. You’ve got the level of direct knowledge that public comment periods are supposed to be for. And, Lord, do those sessions need some serious help. King County Council, Sound Transit Board…. just start attending so I’m spared having to relate the pathetic waste of a valuable resource that now passes for Public Comment. Start showing up and telling your representatives what you just saw that day. On a highly regular basis. And encourage your co-workers to start doing the same. On this one, solid amount of solid testimony counts. As do delivery, coherence and basic mental health. There’s also generally at least one reporter in attendance. Please get back to us and let us know how first one went. I would happily do as you request, Mark. But it won’t work. Because I have been doing just that. Going back to 1991. Not just with transportation either. For topical brevity, I have designs to house every homeless person in the County for less than Seattle pays in one year. Regardless of design or topic, the answer has always been the same. From Murray’s people, Durkan’s people, and The Gates Foundation. In public they’ll praise you, hand you their card, and tell you to email them. And then just never respond. Ever. Those in power do not want to change. They profit from the status quo. There is no fundamental incentive for those in positions of authority to improve the daily lives of local citizens. Until that changes, I’m talking to a wall. Over 25 years of humoring people is quite enough, isn’t it? Having recently visited Colombia I had a chance to experience an emerging 1st world city in Medellin and a truly 3rd world city in Bogota. Medellin implemented a Metro strategy and Bogota a BRT based strategy. The impacts are obvious. It didn’t take long for Bogota to realize the magnitude of their mistake and have initiated steps to implement a Metro with construction of their 1st line to be completed by 2024. Any visitor will tell you Bogota has a lot of catching up to do! Young educated locals will tell you the same thing, ie, move to and invest in Medellin and avoid Bogota. And Metro comes up in every conversation! I assume both Bogata and Mendellin are a lot denser than Seattle. A question like “Is King County’s transit good?” is really asking about people’s perceptions, not about objective measures. Even STB transit fans will always find fault in the status quo no matter how good it is. I tolerated 30-60 minute buses because I thought nothing better was possible, and now I enjoy full-time15-minute service on the C, D, E, 5, 10, 40, 49, 62, etc, and 15-minute weekday/Saturday service on the 8 and 11. But now my frustratiion is I have to wait 15 minutes for a transfer. I used to wait 25 minutes or 40 minutes. I know intellectually it’s better now, and I enjoy going to West Seattle and Greenwood and Aurora in the evening without having to deal with 30-minute buses, but when I transfer to a bus and it’s just left and I have to wait 15 minutes and there’s no bench to sit on, my immediate concern is that I wish they were every 5-10 minutes. There’s some of that happening here. Especially when you consider that many county residents have never ridden the bus or have unrealistic ideas about what’s possible. (Like this contradiction: “We want more bus service but we don’t want to give up GP lanes or parking spaces for it, and we don’t want to build a train tunnel either.” Well, how do they think more bus service is going to happen then? Just get more bus bunching and buses stuck in traffic?) If the survey was a random sample, most of the respondents would be like that. Increasing ridership? Metro is FIRST nationally for major cities. Coverage? More than 85% of the City by area is now within a 15 minute walk of frequent transit (e.g. 15 minute headways throughout the day at least on weekdays). Percent of downtown commuters taking transit? It’s over 40%, the highest of any mostly-bus system by far. Places like New York City, Chicago and San Francisco with well-developed metros are higher than Seattle, of course. Your opinion? Not so much. I’ll take options 1, 2, and 3 Alex. Vanna can turn over the letter for option 4. Based on what? Polling. You know, The Seattle Times post being referenced? 26% of Seattle voting households, and 27% in South King County. The only larger concern for transit in the region was immigration influx. More local people are disappointed in Seattle mass transit than total people visit this site in a day. Can you not hear their cries? At what % would you stand up and take note? Seriously. I’m curious. The poll doesn’t break down concerns to specificity. But if I were a betting person, I’d say the Seattleites want more mass transit in the city, and most county residents want more mass transit to suburban and rural locations (King County residents polled could live in Sultan or North Bend, for example). Considering entire regions of the county don’t have the same level of transit they had 30 years ago (especially on weekends), I’d say the county residents have a point. When you rely on transit, without a car, suddenly off peak, weekend, and rural routes are a Godsend, infinitely more important than pandering to commuters. Metro and ST know this, so they sell transit packages with promises of “increasing footprint” to bait rural voters, then switch and add infill 41s and 554s, not increasing the transit footprint one inch. When a government agency intentionally pulls fast ones like that, people start chanting “Equality, liberty, and fraternity!” in French. Here’s an example of how corrupt ST is. There are on the books, paper records of ST’s promise to provide 554 service every 15 minutes, from start of service to end, both directions. Contractual agreements independent of ridership. Take a look at the 554 schedule now. People who just prefer to drive, people who are scared of the people they might encounter on transit, people who once had one bad experience and vowed never again, all those people would answer the question you point to in a negative way without having the slightest bit of information behind their answer. Breadbaker, sorry for the odd location of my reply. Nesting quotes has never been STB’s strong point. That comes across as quite a biased viewpoint, and one that does not stand up to logic. First of all, non bus users live here too. They have a right to be heard and their grievances addressed. Second, the individuals you mention would choose a different option than the dissatisfied 26%. The 26% are saying the current system is inadequate. If they were car fiends, they’d starve Metro/ST of funds, not suggest they need more. The people saying transit should do more, the people refusing to give up street parking or GP lanes for transit, and the people saying every transit measure is too expensive, are in aggregate the same. Even though there are different people saying those things, the aggregate effect of such a large percentage saying them means it’s de facto the same. Somebody believes the Seattle Times Editorial Board, which is usually for the first two and often for the third. And a mere stat that “25% think transit is inadequate” doesn’t say as much as it appears. It doesn’t say why they think so or what they think a good system is. If you ask them that you’d probably get a lot of different answers, some of which we’d agree with and some we wouldn’t, and only some that’s helpful in trying to find practical ways to improve the system. Dude, transit is not entirely a social service. It has an element of that, for sure, and should. But if there are people waiting for a 41 or 554, it’s a HELL of a lot more important to get them to work that run some wandering bus with two people on it through the boondocks. I understand that there are poor people in the urban fringe. If you can convince your fellow citizens to tax themselves to give those poor people in the urban fringe subsidized Lyft or Uber rides, more power to you. I doubt you’ll be successful. But in no known universe does it make sense to send 40′ — or even 30′ — public buses down country lanes. 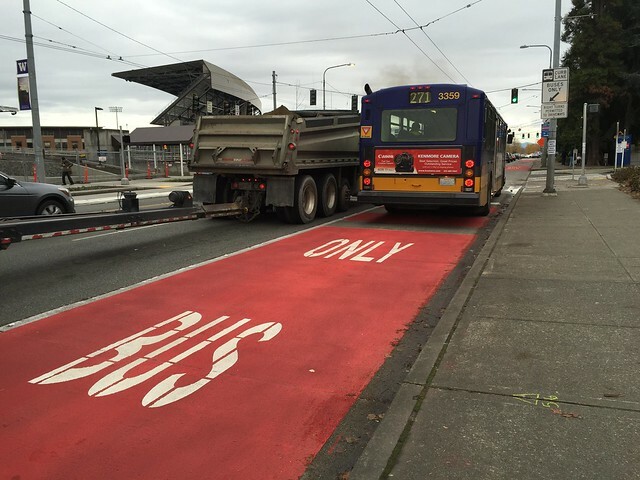 Metro and the King County Council that funds it finally have “grown up” to focus on high capacity corridors where bus service can make a real difference in a lot of people’s lives. Seattle voted for the last two local-transit supplemental measures (Prop 1 and Move Seattle). King County voted against the last two countywide Metro measures. And South King County voted against all of the last several Metro and ST measures. Gotta agree with Tom above. The primary role of mass transit is to meet transportation needs en masse. Social equity issues are important but secondary. And political issues should matter about as much as they do for sewers! In fact, many bus and train systems fail because they were designed with the primary goal of serving the poor, and/or an influential politician’s district, regardless of actual transportation demand and needs, meanwhile reinforcing the myth that public transportation is “for the poor.” In the end, we can’t expect to put much of a dent on the affordability crisis by running more busses in the exurbs, or even more commuter trains in the exurbs for that matter. The way to solve the affordability crisis by adding more housing where there is better access to jobs and opportunities. Polling non-professionals who are more than likely completely ignorant of other cities’ transit systems about transit service is like asking Baboons if Lions are evil. Wow Tom! What an amazing and true statement! Now, how does this apply to the Stakeholder and Elected Official Committees now planning in West Seattle and Ballard? The ridership doesn’t show up. The reason 520 has heavy bus service peak hours and hardly any evenings and weekends is that ridership and trips are heavily commute-oriented, in a way that Seattle routes aren’t. When you have people not able to get on a bus because it’s full, it’s hard to argue against running more buses at that time. Especially when the majority of voters are screaming at you to do so. The 554’s ridership off-peak is pathetic. The 554’s off-peak ridership is not *that* bad. I’ve ridden it several times to go hike Tiger Mountain on a weekend, and there’s usually at least 10 people on the bus. And, occasionally, when the Seahawks are playing, the weekend 554 can get crowded enough that people actually have to stand. What matters is the absolute level of transit, not how it compares to the extremely-inadequate US. “Fast-growing” is not enough to get the car-use rate down below 50%. The fastest growing cities are those that double their population from 1000 to 2000. Yes, and that’s in danger of going away in 2020 when Prop 1 expires. It’s 2019 and there’s still no permanent solution. “Seattle-based Elway Research developed the poll in conjunction with The Seattle Times, which funded it. A total of 680 adult residents of King County were interviewed by telephone for this survey, resulting in samples of 407 in King County and 419 in the city of Seattle (146 Seattle respondents were included in the King County sample). The interviews were conducted December 15-18, 2018, by live interviewers; 49 percent were conducted via cellphone. Pollsters almost always weight results so oversampling is rarely a problem. The most likely time that it is if the data collection methods have inherent biases (like using land line phones only) or calling only at certain times. The limited sample size does make any cross-classifications worthless. Because of that, i can’t take this poll very seriously either. 680 respondents? That’s huge. Prelim medicals are in the 1-2 dozen. Most political samples aren’t even 300. Statistical extrapolation is infinitely better than you might realize. Sorry but I disagree. Most political/opinion polling done today has sample sizes varying between 500 and 1500 respondents. Some are even larger, particularly when a more granular level analysis is needed. Back in 2008 election cycle, Nate Silver even began using sample size in his poll weighting (see link below). Of course the same basic statistics principle still applies: The margin of error depends inversely on the square root of the sample size. Medical and/or drug trials’ and their respective sample sizes are totally different animals than public opinion polling. Most of the polls Nate Silver has used in his aggregate data to accurately predict the last 3 presidential elections have a sample size under 500. Nate Silver has literally proven me correct on this one. Tlsgwm, those are exit polls from Nov. 8. Silver doesn’t use those to predict anything. Predict. As in information gathered before election day. I thought something was fishy with your first link. Lol. Now you’re just making crap up. The polling data goes back for months and months and it is exactly what Silver incorporates into his forecast modeling. You’ve just shown your hand. Game over. 419 in city of Seattle. I get that 419 + 261 = 680…but otherwise I don’t understand. All Seattle residents are KC residents. Why 407 in the KC sample and not 261? Great data for transit advocates to use… but it sure doesn’t seem to track with reality. There must be many caveats here. Maybe this is one of those survey biases — like how a majority of voters rate Congress dramatically low but rate their own particular congressmen highly? I mean take an obvious one. If so many county voters support more and better transit, then why do we repeatedly struggle to get transit measures passed countywide? Or something I have seen in the southwest. Homeowners demanding more transit service, but what they really mean is a one-seat ride into Downtown — even if you offer them higher frequency but a required transfer. It is also quite possible that voters want better transit, they just don’t want to pay for it. This sort of thing is quite common. If I’m not mistaken, voters in this state have voted to spend more money on schools (by reducing class sizes) at the exact same time they voted to reduce taxes. What is interesting to me is that people prefer focusing on transit, versus more roads. That is generally a clear cut choice, and not conflicting in the least. Homeowners are the Seattle Times’ target market and its Editorial Board’s bias, so that could have something to do with why homeowners were overrepresented. We don’t constantly struggle countywide. The last was ST3 (virtually countywide) and that passed handily. 2014 was an April special election and failed. King County approved ST2 in 2008 and Transit Now in 2007. And the county’s population is far more cosmopolitan, and resigned to being a big city, than 10 years ago. Of course, that was more than 20 years ago, and he would have thought a newspaper publishing a transportation poll partially funded by a region’s most ardent transit opponent (without even mentioning as much!) was dystopian fiction. Oversampling homeowners by 20 percent on land-use and transportation policy (stop for a quick sec and process that) and then deciding to publish with only a passing reference to the fact would be hilarious — if only it were fiction. Martin is, as ever, nuanced and restrained and generous. But calling this anything other than a homeowner poll merits calling BS in all-caps. The 554’s ridership is irrelevant. A promise is a promise. A contract, a contract. There’s no ridership exception. I don’t care if they have to run 66% of the busses empty. People must be held to their word. Companies and government organizations an order of magnitude more so. When Sound Move was altered into ST1, it resulted in this (regionally) unprecedented pattern of paying for yesterday’s promises with tomorrow’s money. Unless you want to compare ST to WWPPSS. We need a “block” function now that we’re getting seriously infested with trolls. I KNOW you can do it Frank. A Joy, you’re making a lot of hard-and-fast demands out of any random group of 25 years. History works in. literally, fits and starts. Very often a major beneficial change must wait for a single change in either machine design or materials to make the whole thing possible overnight. A trolleybus power conditioning mechanism used to require a braided metal cable to from the power pedal to the motor. Perfectly serious when I say that more than one other person might, with no fraudulent intent, be ready to take your plan public. Possessed of the wherewithal to bring it about. Voting age is 18 (wish somebody’d take viral a campaign to make every high school student aware they can be a State legislator before they graduate). So there’s a very good chance somebody who’s admired you and agreed with you since they were five could take office and legislate as you’ve been demanding all these years. I mentioned a day or two back how heavily Republican our transit system’s birth really was. If the Election authorities will let you say “Prefers Lincoln Republican”, (“Moderate” means combination ISIS and Taliban) some voters might surprise you. And everybody else including themselves. Because given the time and fierce dedication you’ve given your ideas over two and a half decades, if you want the necessary politics done right, whether you get it done right or not, you owe it to yourself to ask voters to at least let you try. I was actually in the survey. There is one answer I gave that I think could use more nuance. I said I don’t support more tolls like i405. Not because I don’t support tolling, but because they should toll all lanes like the 520. They also had a bunch of homeless questions. I wonder when they’ll do a writing about those. They can’t. Federal Law prohibits tolling existing roadways except where additional capacity is added or a complete replacement of a facility is undertaken (e.g. a bridge is replaced). Oregon may be able to use its VVPP “waiver” for the tolling along I-5 in Portland, but it’s a close thing. The Obama FHA would probably have approved it, but Oregon dithered their chance away. Now it’s Elaine Chao handing out the goodies and she is NOT pleased by Democratic tolling plans. There’s no exemption for Lexi, Maseratis, Ferraris, and Bimmers. I think that only covers interstates. Though there are exceptions: had it been politically palatable locally, I believe we could have tolled the I-90 bridge at the same time as SR-520 in order to reduce the urge to take the free bridge. Feel free to correct me if I’m wrong.